Lake Wingra’s natural setting and calm waters may lead you to believe that erosion is not a large concern there, but it is at Wingra Park. Erosion, a natural process that results in part from wave energy, can occur at slow rates, but human activities can accelerate the process. Wingra Park is subject to a variety of human activities like log rolling, paddling, and motorized boating that have contributed to eroding the shore­line at a rapid rate over the last several years. To combat this erosion, the City of Madison Engineering and Parks Divisions will be stabilizing 350 linear feet of the severely eroded shoreline in 2018 between the Wingra Park boat launch and the east property line of the park. The design incorporates a variety of soft and hard armor erosion control practices. Soft armor imitates natural systems and therefore can integrate into the ecosystem. Natural vegetation not only provides habitat for wildlife, but is great for slope stabilization. Roots help keep soil in place as waves wash up on the shoreline. Aside from the environmental benefits, soft armoring also can reduce maintenance costs. Hard armoring is when man-made structures are used to stabilize a shoreline, like rock riprap. While this may be necessary in some settings, too much hard armoring can worsen erosion in other parts of the shoreline since it will redirect the wave energy elsewhere and does not mimic natural settings. Rock riprap is large rock placed in the water and up along the shoreline. 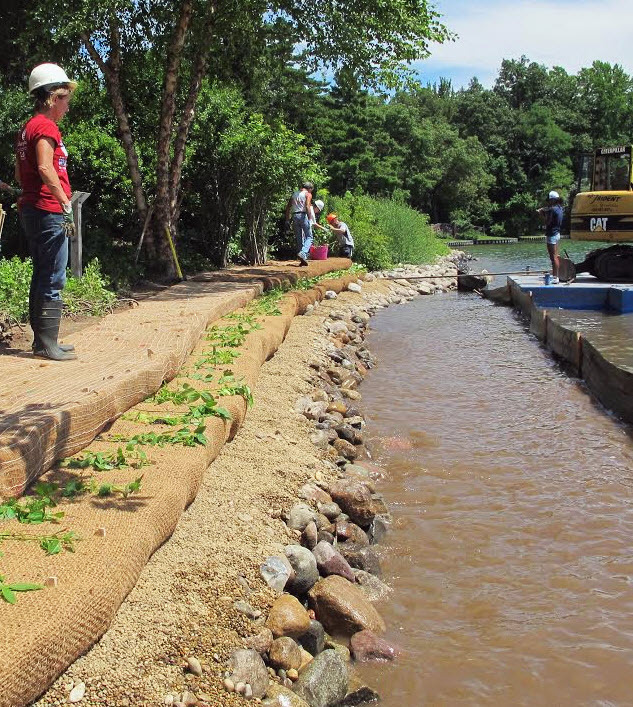 At Wingra Park geotextile fabric will line the shoreline underneath the riprap to prevent wave action from removing soil and rocks below it. Soil encapsulated lifts. Lifts create an aesthetically pleasing view while helping reduce erosion. They form a desired slope by layering biodegradable blankets full of soil. Each layer contains seeded and planted natives. Native sedges and forbs less than three feet in height and tolerant of fluctuating water levels will complement these erosion control practices. While new vegetation will be added, existing trees along the shoreline will be preserved with the exception of one maple near the shoreline, which is in unhealthy condition. In addition to stabilizing the shoreline, the project will also enhance water-access opportunities. 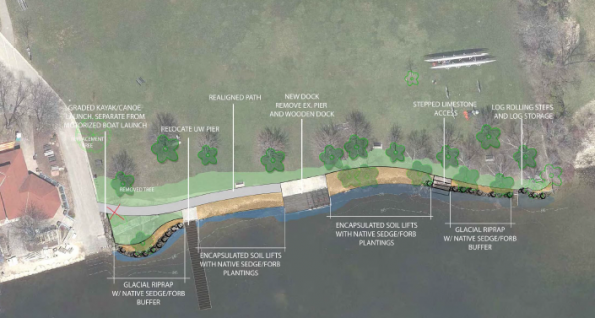 The park will have a new dock, a replaced asphalt pathway, limestone steps to the water, and a new small canoe and kayak launch. The design will also move the UW boating pier from the current dock and place it further west along the shore, towards Wingra Boats. We will keep you updated on the project; it is one we’ve engaged with the City on since the early planning stages along with other key park users like Wingra Boats, UW rowing, and Madison logrolling. 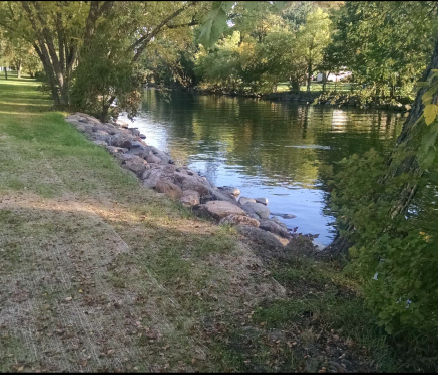 Since Wingra Park is thoroughly enjoyed by many of you and Lake Wingra’s wildlife, we’ve communicated our preference to the City to request for qualified contrac­tors with experience in shoreline stabilization projects to the extent it complies with their bidding process. We believe such a request will ensure protection for this sensitive area during the construction process.